Are you looking for the best rhinoplasty surgeon in Los Angeles? Dr. George Sanders is a highly skilled and experienced plastic surgeon in Encino who performs rhinoplasty in Los Angeles, providing patients with an enhanced appearance and improved breathing. Read on to learn more about the rhinoplasty procedure and the remarkable aesthetic surgery results that Dr. Sanders’ patients can achieve. Rhinoplasty, or nose reshaping, can be performed for a number of reasons. Southern California rhinoplasty patients visit Dr. Sanders to address cosmetic issues such as a bump on the nasal bridge; to improve facial symmetry and balance; and/or to enhance airway function and improve breathing. Compared to other cosmetic surgeries of the face and body, rhinoplasty is functionally and conceptually a very complex procedure. Bumps or asymmetries of the nose can be eliminated or the bridge can be raised or lowered. Also, the tip of the nose can be turned up, turned down or reduced. The reshaping of the nose must be highly individualized so that the changes to the nose shape complement the other facial features. The specifics of rhinoplasty can vary greatly depending upon patient needs. In some cases, it is necessary to graft a bone or cartilage to the nasal structure. As a highly experienced nose surgeon in Los Angeles, Dr. Sanders performs two types of rhinoplasty: “open,” or external rhinoplasty, and “closed,” or endonasal rhinoplasty. In an open rhinoplasty, a small incision is made in the tissue between the nostrils. During a closed rhinoplasty, the incisions are totally inside the nose. The decision of whether to have an open or closed rhinoplasty is made based on which approach is appropriate in achieving the patient’s goals for the surgery. The goal of cosmetic nose surgery is to harmonize the nasal appearance with the rest of the face and to make the nose appear more attractive. At the same time, the airways can be improved by altering the internal nasal structures. As stated above, due to its intricate nature and the individualization required for each patient, rhinoplasty is one of the most challenging procedures for a surgeon to perform. It calls for the highest degree of skill and aesthetic artistry. Dr. Sanders has multiple years’ experience performing the most complex rhinoplasty cases. His record of excellent surgical results attracts numerous nose surgery patients every year. 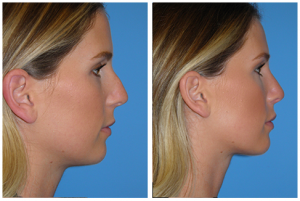 To view Los Angeles nose surgery results from previous patients, visit our rhinoplasty before and after photo gallery. In an open rhinoplasty procedure, an incision is made across the columella, the strip of tissue between the nostrils. Through this incision, the doctor will raise the skin, expose the nasal bones and cartilage and reshape these to improve the external appearance of the nose. This may involve removing bone or cartilage or adding cartilage grafts, either from the septum or the ear. At this time, the doctor may also straighten a deviated septum or make any other corrections to the internal structure of the nose that will result in improved nasal breathing. Once the changes are made, the doctor will redrape the skin and tissue over the nasal framework and close the incision with sutures. Nasal packing is not required! In a closed rhinoplasty procedure, incisions are placed inside the nostrils, in the nostril lining. Changes to the nasal structure are made via these incision points, which are then closed with sutures once the surgery is finished. The price of rhinoplasty varies based on the needs and aesthetic desires of the patient. During your consultation with Dr. Sanders, he will provide you with a price estimate that is based on these individual factors. Dr. Sanders also offers financing options, which create an affordable monthly payment method with low to zero interest. To schedule a consultation with Dr. Sanders, contact his office at (818) 981-3333. After surgery, you may experience mild discomfort in the nasal area, and possibly a headache, for the first day or two. Your doctor will prescribe medication to help with the discomfort during this time, after which an over-the-counter pain medication is usually sufficient to reduce mild discomfort. Bruising and swelling of the nose and sometimes eyes after surgery is also common and should subside within the first two weeks. There may also be nasal congestion as a result of swelling. You will have a cast on your nose as it heals, which the doctor will then remove, along with sutures, about five days after surgery. You can usually return to work at that point, and resume exercise two weeks after surgery. In addition to helping many Encino rhinoplasty patients achieve a more refined nose and facial profile, Dr. Sanders can also improve the appearance of lines, wrinkles and sagging skin with a facelift. His extensive cosmetic surgery experience and skill has helped Encino facelift patients look fresher and rejuvenated. Visit the facelift pages to learn more about the procedure. Other facial rejuvenation procedures Dr. Sanders performs more often include eyelid surgery, neck lift and forehead lift in Los Angeles. Please explore the respective procedure pages to learn more about these sophisticated treatments offered by Dr. Sanders. Are you unhappy with the size or shape of your nose? A rhinoplasty procedure helps balance the appearance of your nose shape with the rest of your facial features, resulting in a subtle, natural enhancement of your entire face that still reflects your own personal beauty. Find out more during a private, personalized consultation with Dr. Sanders. To schedule this consultation, contact Dr. Sanders’ office at (818) 981-3333. NASAL SURGERY TODAY: BETTER THAN EVER! HELP! MY NOSE IS GROWING! !